We’d attempted to ride the entire Trans Cambrian Way in a day earlier this year, naively expecting there to be sufficient waymarking for us to navigate the route with minimal checking of the map – we were wrong. So with the benefit of experience (and some superb technology in the form of the Memory Map Adventurer 2800 that Dave had treated himself to), we embarked on our second attempt at successfully riding the whole of the route in a single day, with the possibility of beating John Houlihan’s record. The now-customary Daft Ride early start of something like 4am kicked my head in as usual as I ate a large fruit-based breakfast whilst drinking caffeine-laced beverages during the 120 mile car journey to Machynlleth where Dave and I would meet, transfer his bike and some food, etc to my car before leaving his car there and then driving another 50 miles to the start of the route in Knighton. After car park faffing, we set off around 9:30am, only half an hour behind our intended schedule and reacquainted ourselves with the silly-steep grass climb out of Knighton. Quite soon we were referring to the whizz-bang GPS device and it was more than justifying Dave’s expense 😉 as we were quickly putting things right when we went slightly off course. 3 and a bit hours later (including non-riding time for opening gates, etc) we’d completed ‘day one’ and arrived in Rhayader. IMBA suggest that the route is a 3-day ride so throughout this post I will refer to the three sections of the route as days one to three. Pressing on along easier cycle lanes for a few miles, the going gradually got tougher again as we arrived at Claerwen Reservoir. The bridleway follows the bank of the reservoir, and out of every inlet along its length making onward progress seem much slower as we followed the convoluted path gradually westwards. The headwind was making things seem more difficult compared to our much faster pace along this section during our first attempt at the route. Despite this, we were soon speeding away from the reservoir, save for a few more brief map/gps/gate/food stops and on towards the scene of one of the major wrong turnings last time. We successfully avoided the village of Ysbty Ystwyth, which was good as I think I’ve convinced myself that it’s some kind of village of the damned. Apologies if you live there, but the last time I was there it was at least 10 degrees colder, much darker and significantly wetter than anywhere else I’d been that day. Oh, and I was lost at the time which probably didn’t help. More climbing, descending, opening gates, checking the GPS, checking the map, consuming Shot Bloks, energy bars and sweets followed, the route punctuated by several large hub-deep puddles, stream crossings, what seemed like river crossings, one memorable singletrack downhill that we thought was the climax of the ride but wasn’t and a few steep, slippery and sometimes terrifying slate descents that always seemed to be right next to a yawning chasm full of rocks, sheep, more flowing water and probably certain death. Mostly though the route comprises of rocky fireroads, grassy climbs and narrow rutted sheep tracks. Oh, and poo. Lots of poo. I’ve never been covered in so much poo in all my life. Actually I might have been covered in a lot of poo occasionally when I was a baby I suppose..but still, there was a lot of sheep and cow dung lying around in the middle of Wales. ‘Day 2’ was definitely harder than day 1, but still we completed that in a matter of hours and pressed on with what I thought was going to be the straightforward matter of the shorter, less hilly ‘day 3’ section of the route. It wasn’t more straightforward, mainly because we’d not made it this far on our last attempt and thus had to check the map more often – the waymarking was sometimes very good indeed, but at other times it simply didn’t exist – and our expectation of the route being somehow easier was very wide of the mark. More climbing, more scary descending, more road sections into the wind, more poo. Oh, and rain. Seeing the massive rain cloud that shrouded the hills before us did give us prior warning of the soaking that we were about to receive and to be fair, we’d been very lucky with the weather up until now. But what a soaking. Eventually we had to stop and dig out waterproof jackets from our packs, the warmth immediately putting smiles back on our faces…well almost. ‘This is the final descent then’ seemed to be the catchphrase of the next couple of hours – unfortunately the final descent was often far from the final descent, it would be followed by another climb.. or another wrong turn (that was signposted as the ‘right’ way! 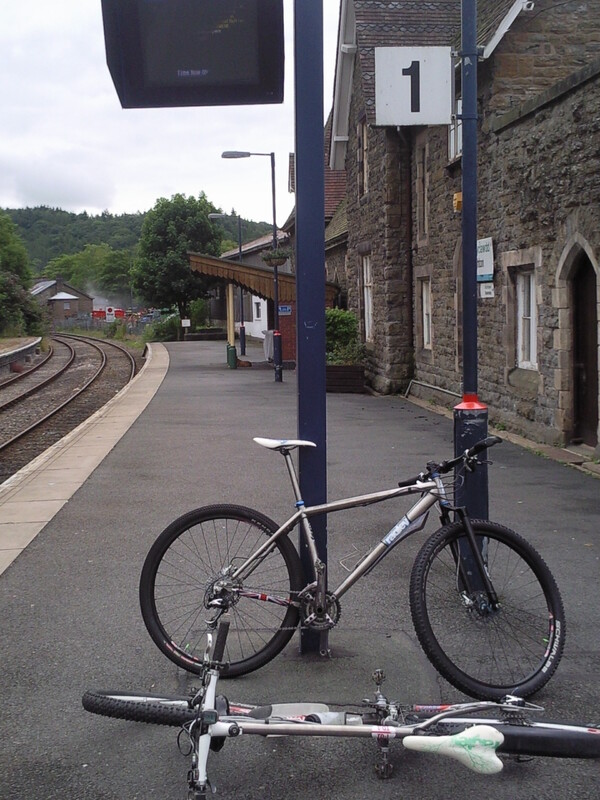 )..eventually though we did arrive at the final descent down to the road where we would reach Dovey Junction train station and the end of our ride, 12 hours and 10 minutes after we’d left the start of the route at the train station in Knighton, the whole width of Wales having passed under our wheels. Our actual riding time was 9 hours 51 minutes, so the previous record of 12:25 has been well and truly beaten. We each congratulated each other, ate some sweets to celebrate (were you expecting us to have cigars?) then back to the car which if you remember, we’d left in Machynlleth earlier in the day, food scoffed, clothes changed, then back to Knighton to where we’d left my car at the start of the ride. More faffing, a quick natter about plans for Sleepless in the Saddle next week then off we went our separate ways. By now it had gone midnight. Had some unexpected extra ‘fun’ in the form of driving through the middle of crowds of drunken revellers in the road and my first visit to McDonalds for 10 or so years. When did Maccy D’s start opening for 24 hours? Not that I was complaining. Hit the North 6 - the race that very nearly wasn't.